“A prominent feature of the church is its round tower, modelled on the old celtic round towers, so common throughout Ireland. 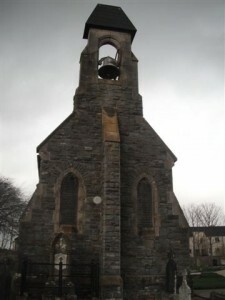 It rises to a height of 100 feet, is visible from a very long distance and contains a side entrance to the church and a staircase to the organ gallery. Over the main entrance in the western gable of the church is a “rose” or “wheel” window, lighting that end of the edifice, showing high above the organ gallery. The side walls are pierced with lancets, at an elevation that leaves ample room for the altar and other equipments. With the exception of the entrance doors, which are of oak, all the wood-work is of choice pitch pine, which is now recognised as most enduring as well as producing the most ornamental effect. The roof is covered with American green slates, which contrast pleasantly with the light blue shade of the admirable masonry, and the pale dressings of Dungannon stone. One feature in the construction deserving special reference is the system known as ‘hollow walling’, by means of which, no matter how absorbent or porous the outer facing may be, the inner surface is always dry. There are practically two walls, the outer of stone, the inner of brick, two clear inches apart, and connected by slate ties, one to every superficial yard. St Eunan’s is of the Romanesque character, modified to meet modern requirements, and is constructed to accommodate from 800 to 1,000 worshippers. The dedication ceremonies were carried out with all the solemnity and order accompanying the sacred rites of the Catholic Church. The morning was most favourable, the consequence being the large numbers of strangers, while the people of the parish, including a large accession of Protestants, turned out en masse. The Lord Primate performed the dedication function before the High Mass, which was celebrated by Rev. John Doherty, with Rev. P Blake, Deacon, Rev. John Mac Nulty, Sub-Deacon, and very Rev. John MacMenamin, Master of Ceremonies. The three Miss Reillys, Teachers in Raphoe, Glenties, and Falcarragh, were the most capable and most appreciated members of the choir. After the first Gospel, His Grace the Primate addressed the congregation for almost three quarters of an hour in that strain of instruction and devotion for which the distinguished speaker is proverbial. His Grace founded his discourse upon the last portion of the eighteenth chapter of St Matthew: ‘Lord, how often shall my brother offend against me and I forgive him?’ and so on. The peroration was particularly touching; he appealed to those present not merely to forgive their neighbour, but to practice charity, and to exhibit true generosity by giving liberal aid to their zealous Priest, Father Bernard Kelly. This Church of Romanesque style and dedicated to St Eunan, was blessed and opened on Sunday 3rd November 1878. The tower, modelled on the old Celtic round towers, rises to a height of 100 feet and an unusual feature, for that early date, is that, it has cavity walls, an outer wall of light blue stone dressed with pale blue Dungannon stone and an inner wall of brick. St Eunan was born in 624, very probably in Ballintra in south-west Donegal and died as ninth abbot of Iona where his kinsman Columba had founded a monastery in 563. Eunan’s mother was from the Raphoe-Ballindrait district where Eunan spent the last seven years of his life. He is regarded as the founder of the Raphoe Diocese and he either built or renovated the Cathedral of Raphoe before he died in Iona in 704. It is probable that his remains were later transferred to Raphoe. 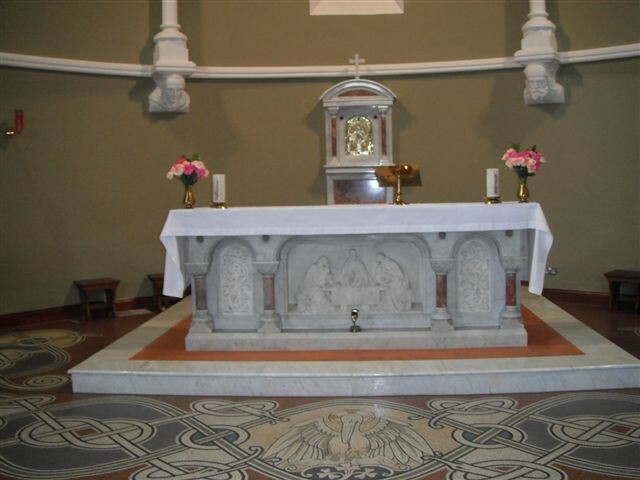 Behind the Altar is the Tabernacle where the Consecrated Bread or the Blessed Sacrament is reserved for the faithful and especially for the old and sick. The red light which burns day and night in the Sanctuary indicates what we call the Real Presence of Christ – the food of our soul. The Stone Heads which act as corbels to the pillars above represent (from left to right) St Patrick, St Columba, St Eunan and St Brigid. The colourful centre window shows us the victorious risen Christ. Above his head is written in Latin the task he gave the apostles : Euntes (Going) docete (Teach) omnes (all) nations (Nations). In the top left-hand corner are the crossed keys symbol of the power given by Christ to Peter and his successors, the Popes. “To you I will give the keys of the kingdom of heaven”. Matthew 16:19. From the mound on which he stands come seven streams which represent the seven sacraments by which his very life is not only given to us, but also nourished and strengthened and restored when lost by serious sin. The window on the right represents St Columba who was born at Gartan near Kilmacrennan, in 521. He holds in his right hand a chalice on the book of the Gospels and in his left hand a crozier, symbol of his position as Abbot of Iona. Near him kneels St Baithin who was his successor and who holds a book of Psalms on which was written the last verse transcribed by St Columba “But they that seek the Lord shall not want any good things”. Ps 33. Knowing that death was near, he stopped writing and said “I must stop here, Baithin will do the rest”. In the foreground is a crane which fell exhausted in Iona after a flight from Ireland. He cared for it until it was able to make the return flight. As Columba is the Latin for a dove, it is not surprising to have one here to remind us that he was also known as “the dove of the church”. Written in Irish is an invocation to Saints Columba and Eunan to pray for us. The inscription at the bottom of the three windows read as follows: “In loving memory of James Furey and Margaret, his beloved wife…. 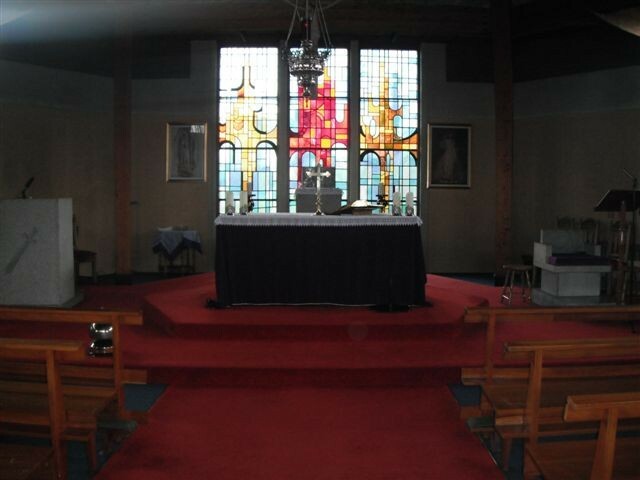 (the centre window continues) “their family, Father Dan, Margaret, Bridie and Elizabeth donate”…. (The third window continues) “these windows. A.D. 1941.” Father Dan referred to was later Vicar Capitular of the diocese on the death of Dr MacNeely in 1963 and Vicar General from 1965 until he died as Parish Priest of Glenties on February 1st. 1971. At the top of the Church and turning right we are reminded of the weakness and fickleness of human nature and of the possibility of losing the new life begun at Baptism, by turning away from God in sin, here is what is known as the Confessional. Priests exercise the power of restoring that life which Christ gave to the Apostles when he said : “Whose sins you shall forgive, they are forgiven; and whose sins you shall retain, they are retained.” At the Font a new life begins; at the Altar that life is nourished and strengthened by Holy Communion and at the Confessional, the Sacrament of Reconciliation or Penance restores it when lost through serious sin. Turning away from the Sanctuary, the first window on the right shows us Christ as king (Christus Rex). On the book are two letters – the first and the last of the Greek alphabet – Alpha and Omega signifying that Christ as God is the beginning and end of all things. The second window on the right is that of Maria Regina-Mary the Queen of the World. This was given to Our Blessed Lady by Pope Pius X11 in 1946. Opposite is a window of St Patrick vested as a bishop with a model of a church in both hands. The third window on the right is one of St Joseph with a lily in his hand. This recalls a legend that a husband for Mary would be the one whose staff would flower and bloom. Opposite St Joseph’s window is St Brigid’s where she is shown holding a crozier – the symbol of her authority over many monasteries and convents which she founded. The fourth window on the right is that of St Therese of Lisieux in France. She is sometimes referred to as “The Little Flower” because while she was on earth (died 1897) she was content to be a small insignificant flower in God’s garden. She said, however, that she would spend her heaven showering spiritual gifts as roses on those who invoked her. Her approach to God was that of a child to loving father, hence her way to God is called: “The Little Way”. Opposite is a window showing St Colmcille with a scroll in his hand – an obvious reference to his work in transcribing the Scriptures. The Stations of the Cross recall incidents on our Lord’s journey from Pilate’s Palace to Calvary – the via dolorosa or sorrowful way. Here we have sixteen hand-carved plaques from Val Garda in the Dolomites – now the Italian Tyrol. Christ’s death was foretold by Isaac 800 B.C and foreshadowed by Abraham’s preparedness to sacrifice in obedience to God his only son, Isaac. This is the idea behind the first plaque. Between this plaque and the last are the traditional fourteen stations. The final plaque reminds us that death was not the end. Christ conquered death, rose from the dead and ascended to his Father in heaven, in glory and triumph. In Baptism we not only die with Him, but also rise to a new life with Him. Above extract taken from Canon Maguire’s “A History of the Diocese of Raphoe” Vol.II, Dublin 1920 (with minimum additions). St. Mary’s Old Church Convoy. Extract taken from “Convoy Village Its People and Townlands. By kind permission of Aodh Gallagher (RIP) and Marie Slevin. According to Maguire’s History of the Diocese of Raphoe in 1704, the registered pastor was Edmund Brannigan , dwelling at Killynure, forty four years of age. His immediate successor was Dominick Byrne whose name is affixed to the petition of 1737, the next was Terence O. Quinn, a Salamanca student. The earliest available register, Pigott and Co. represents John Kelly as Parish Priest in 1824, residing in Drumkeen. When Maynooth College however was founded in 1795, John Kelly presents himself among the first batch of candidates in Holy Orders seeking admission to the Halls of Theology and Scripture in order to perfect their professional studies. His lamented demise at Drumkeen in 1829 is not registered in any Ecclesastical Directory. In Memoriam, Rev. Jacobi McGinley, Paroch rapotensis qui Per 40 annos, in divessis Paroeciis Pro animorum salute assidue laboravit plenus Meritis, ac Annis migravit ad coronam Sanctis promissam die Feb. 1862 annos 67 nattus. “The Popish inhabitation’s resort for Mass to the neighbouring Parish of Raphoe but tradition assures us that a priest went each Sunday from Priestown and said Mass in the old Scalan in Hillside”. Long before Churches were built, Scalans were used by Priests so that people could have Mass celebrated. There was one in Killynure just at a corner of a field adjoining the Corchasey Road. The altar stone is still intact and a number of stones twenty feet away give us an idea of the size of the shelter. While the Parish Priest had no Church, a priest continued to live in the Killynure area. It has been said by the older generation but never recorded that there was a thatched Church situated in Killynure, near to what is known as the “Goats Acre” long before the Penal times. Even in later days, however sparse the Diocesan supply of Priests may have been from time to time, the Old Cathedral Parish was uniformly well equipped. For close on two hundred years, Scalans supplied the place of the famous Cathedral and through these temporary shelters, which existed in various places, there was always one in Killynure and one in Drumkeen. “In the Counties of Derry and Donegal it was reported and commonly believed that the Chapel of Convoy would be nailed up by the Black Militia, such persons as repaired to Glenfin would be safe and on taking a stocking of meal with them for food, it would do them to the end of the wars. Some weak minded females however not waiting for the nailing of the chapel, repaired to Glenfin with their stockings, but its contents soon became exhausted, in sober sadness they returned to their homes”. 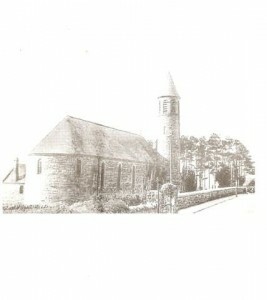 Convoy was by far the oldest of the three Churches in Raphoe Parish. The first portion of the building was constructed about 1795 but it was not completed until 1820. The most important renovation since that date was in 1866 when a Chancel, Belfry, Sacristy and High Altar were added. Dr. Daniel McGettigan solemnly dedicated the Parish Church of Convoy on the 25th March 1866. He also received two hundred pounds from the people of the Parish, which he presented to Rev. McMenamin for the purpose of the building. The Church Cemetery dates back to 1779. The Church was a rendered T Plan Church with a long six bay front to the road, georgian gothic glazed and enlivened by a big buttressed bellcote in stone added in 1860 in the middle of the long front. St. Mary’s Church Convoy (Old and New). The old St. Mary’s Church in Convoy was built in 1795. The original building had a thatched roof, clay floor and seats or forms placed along the walls until 1820, when it was extended and modernised with the introduction of wooden floors, a slate roof and three galleries. The new Church was dedicated by Bishop McGettigan on March 25th 1866. As a Church the building served the people long and well. In the graveyard as well as having gravestones for some families from Raphoe, there are graves dating as far back as 1700, one such gravestone to “Niall of the Nine Hostages”. At the time of the Church’s closure, it was the oldest Church in use in Ireland. The new Church was built in 1971-1972 with a design based on a double triangular shape. The walls both internal and external were built with Irish clay Brick and the exposed roof structure in laminated timber beams. It seats approximately 400 people and has an area set-aside for a private prayer chapel. Bishop Mc Feeley, Fr Britton and Canon Deegan, P.P., blessed and opened the new church in 1972 and in recent years a new graveyard adjoining the church as well as a new car park were constructed. DRUMKEEN’S NEW CHURCH BLESSED AND OPENED. Report from the Donegal Peoples Press of 23rd March 1973. Kindly supplied by Packie and Patsy Bonner, Drumkeen. The perilous era of the Scalan, Mass Rock and the Famine were recalled at Drumkeen on St. Patrick’s Day, when a new Church, dedicated to the national Apostle was solemnly blessed and opened by the Bishop of Raphoe, Most Rev. Dr. McFeely. It was an occasion of great rejoicing for the parishioners, though for the older generation it evoked memories of the old building, which had served as a place of divine worship for 130 years, dating back to pre-Famine days. For a number of years it had been known that a new Church was required in the parish and the urgent need for a fitting replacement impelled the people to exert an all out effort to raise the necessary funds. The response was instant and generous towards the target of £21,000, which the new Church was estimated to cost. This is the second Church to be built in the Raphoe parish during the past nine months, surely a record for the Diocese. A signal tribute to the zeal of the late parish priest, Very Rev. A. McElwee, his successor Very Rev. P. Deegan and the curates who served in Convoy and Drumkeen. Saturday’s ceremonies carried out in lovely weather, brought to the Church a large assembly of parishioners as well as friends and benefactors from all parts of the Diocese. The special sermon, during concelebrated Mass in the new St. Patrick’s Church was preached by Father Deegan and was regarded by priests and people alike as one of the most instructive and eloquently delivered at any church function over a long number of years. The new Church of St. Patrick was blessed in the presence of a very large congregation by Most Rev. Dr. McFeely, who was assisted at the blessing by Very Rev. Patrick Deegan, P.P., Raphoe and Rev. M. Herrity, C.C., Drumkeen. Master of Cermonies was Rev. P. Britton, C.C., Convoy. The Chanters were Very Rev. C.J. Canon Mulreany, P.P., Stranorlar, Very Rev. Cathal Canon O’Callaghan, P.P., Dungloe and Rev. B. McCafferty, C.C., Stranorlar. His Lordship was the principal concelebrant of the Concelebrated Mass. Other celebrants were Rt. Rev. Monsignor E. Long, P.P., V.G., Donegal, Dean of Raphoe, Very Rev. Canon Finnegan, P.P., Rathmullan. Fr. Britton was master of ceremonies, assisted by Fr. Herrity, who read the first lesson. Fr. Britton read the second lesson and Fr. Deegan read the Gospel. Laity who read the Prayers of the Faithful were Messrs, John C. Duffy, Charles Sweeney and P. Brown. The Offertory Gifts were brought to the Altar by Mr. and Mrs. Guthrie, Miss Ann Boyle and Pat Traynor. The Choir was trained by Miss Alice McMonagle, N.T., and Father McCafferty was on the organ. Among other clergy present were Rt. Rev. Monsignor McLaughlin, P.P., Carrigart, Very Rev. J. Canon Glackin, P.P., Killymard, Very Rev. T. Canon Doherty, P.P., Dunfanaghy, Very Rev. D. Cunnea, P.P., St. Johnston, Very Rev. J. McDaid, P.P., Glenfin, Very Rev. J.J. Haughey, P.P., Kilmacrennan, Very Rev. P. McDaid, P.P., Termon, Very Rev. J. Kerr, P.P., Glenties, Very Rev. Dr. J. Marron, P.P., Crossroads, Very Rev. D. McDyer, Adm., Letterkenny, Very Rev. P. McMahon, Adm., Glenswilly, Rev. S. McEntee, E.I., Letterkenny, Rev. P. Arnold, C.C., Milford, Rev. P.J. Young, C.C., Ballyshannon, Rev. A. Laverty, President St. Eunan’s College, Letterkenny, Rev. S. McGeehan, Dublin, Rev. D. Doherty, C.C., Fintown, Rev. P. Kerr, C.C., Clar and Rev. P. Bradley, Letterkenny. Representatives were also present from the Franciscan Community, Rosnowlagh. Among the laity present were Mr. Neil Blaney, T.D., and Mr. Paddy Harte, T.D. Before the ceremonies began and afterwards, the assembled gathering were entertained in a musical programme by the Raphoe Pipe Band. The new Church is constructed to cater for the latest liturgical regulations and has a seating capacity for 420 and cost more than £21,000. It is a steel framed building with brick faced cavity infilling walls. The ceiling is finished in pirana pine and a fibreglass cross is erected on top of the slated roof. 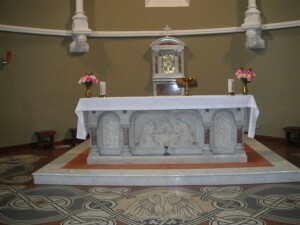 The Altar is made of reconstructed stone as is also the Ambo. There are full length stained glass windows along each side of the Altar which is surmounted by a large wall crucifix. There is ample car parking at the front of the new Church. The main contractor was Mr. Michael Patton, Drumkeen and the Architect was Mr. P. Carr, Ballybofey. The electrical contract was carried out by Mr. William Reynolds, Raphoe and the heating was by Mr. Thomas Murphy, Letterkenny. The seating in the Church was made by local craftsmen and is also of pine. The iron and steelworks contract was carried out by Mr. Joe Bonar, Letterkenny, who also constructed the cross. Carpets in the Church were provided by Messrs. Bondworth of Gweedore and were laid by Mr. Patsy O’Neill of Letterkenny. In the course of his sermon, Fr. Deegan said “The dedication of a new Church in the Diocese of Raphoe is almost a commonplace and it is the accepted thing for clergy and people to be engaged in the building of new churches or the re-construction of old ones. This concern with church building is in no small way due to our Bishop, whose pastoral care to provide for the welfare of his people has given encouragement to priests, who otherwise might have been a little diffident to embark on this sometimes burdensome and often unpleasant task of collecting money, a task which has been an irksome burden on Christianity since St. Paul first asked Christian converts in Greece to bail out the rather disastrous attempt at Christain Communism of the early church in Jerusalem. This concern with building is not due in any degree to a desire on the part of the clergy for self-aggrandisement, a suggestion sometimes un-generously made, or indeed to the purpose of providing work for artisans and architects, however laudible that may be in itself, but merely to the necessity of providing suitable places of worship where the people will be sheltered from the elements while they worship God in their chosen way, places where they will be comfortably warm and have sufficient light to read, where they will be able to foregather round the altar, which represents Christ and together with the priest as the royal priesthood of St. Peter, renew the offering of that central act of worship of-once-and-for-all immolation on the cross, after the manner of the Last Supper. Another reason for this spate of church building and renovation is the fact that many of the old churches were built by a people racked with poverty emerging from the dark days of persecution and often with poor materials on hand. And so it was devolved on the priests and people of today to renew the buildings erected in the early years of the nineteenth century. One of the great builders among the clergy of that period after Emancipation was John Feely, Dean of Raphoe. When on the 1st January 1970 I was appointed Parish Priest of Inver, the Bishop pointed out to me the distinguished line of pastors I had the honour to succeed. Their Lordships McFeely and McNeely, the Cardinals O’Donnell and Logue and the Primate McGettigan, for the bishops were pastors of Inver for one hundred years. I was interested to discover that the last priest, not a bishop, who had been appointed pastor of that ancient parish was Father John Feely, who was sent there in 1849 and who continued in that place for twenty-six years. While there he built a church for the people who had lived in the foothills of the Bluestacks, near the Eany River, near the ancient Franciscan Scalan at Dysert. He built a high church in Drumarone for the people and for God: he built a humble house for himself in Frosses. Before coming to Inver, he had been Parish Priest in Raphoe (I was following him in reverse order) and while there he had built a new church in Drumkeen in the year 1842, mainly out of funds he had collected on a tour among Donegal exiles in New York and Philadelphia. The architecture was neither elaborate nor ornate but very substantial and John Feely realised his cherished ideal that though houses might be humble, churches should be high. There was an old priest of this Diocese whom I knew in my youth who used to refer to this old church and it’s height as “Feely’s Folly”- an expression not uncommon in these parts. But one thing that this old priest did not realise was the contrast that John Feely established between his new churches and the old Scalans which preceded them. In the year 1610, the last Mass was said in the old cathedral before it was dismantled and for close on two hundred years scalans supplied the place of the famous cathedral and though these temporary shelters existed in various places, there was always one at Killynure and one at Drumkeen. Here is a description of one of the churches which preceded Dean Feely’s high church,- “The Roman Catholics had scarcely any houses of worship at all and such as they had were of very humble description. In one place the Roman Catholic chapel on account of the lowness of its walls and having no gables, being thatched all round, was locally known as the “PratiePit”. It was to put a great a distance as possible between his people and that reproach that John Feely built his high church. 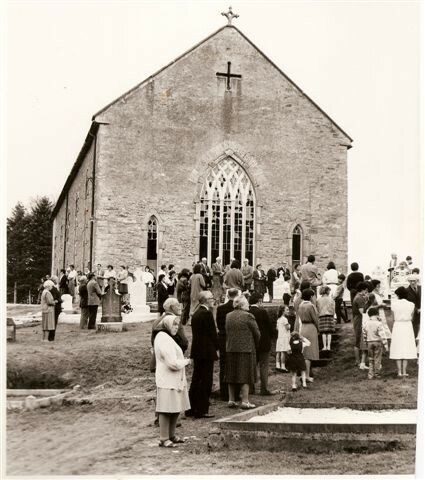 And though you people of Drumkeen may rejoice and be glad today at the opening of this new church, what must have been the joy and gladness of your ancestors emerging from the dark days of denial and the pit into their new high church. Let us think kindly and with gratitude of Dean Feely and his high church and his courage and of his people and their faith and generosity and let us pray that the faith cherished in those more difficult times may not be lost in these balmier ones of affluence and permissiveness. The old church was dedicated one hundred and thirty years ago. It has served the people of Drumkeen and district well. It has seen their days of joy and sorrow: it has been the silent witness to the happy marriage and the sad funeral: it has stood sentinel over the dead; it has been the place where the sinner was shriven and returned to God to receive Him in Holy Communion; it has been the place where a whole people has for one hundred and thirty years assembled to offer their Sabbath-worship to the God who made them. Today we bid it a fond farewell. The decision to leave the old and build the new was not one lightly taken. Many things were considered, the number of people, the falling population, the great cost of renovating the old, the difficulty of heating it, the heavy burden to be laid on so few shoulders. There was one thing, which was never in doubt- the faith of the people, their generosity and their willingness to support the new idea. When after many consultations between Bishop, Parish, People and Architect, the decision to leave the old and build the new was taken, a great link with the past was severed. But we must not dwell in the past for ever. We must now look to the future with new hope and enthusiasm and prepare ourselves to meet the undoubted challenge of a new age with the same strong faith, the same unflinching loyalty to God and Church, the same courage of our ancestors. To enable us to do this we have a new church and a reformed liturgy. But the laying up of new stones does not make a new people. In most ancient religions, temples were built to give their gods a home where they could be worshiped. For us Christians the church building is the sacred place where we assemble to worship God in the way established by Our Lord Himself. This building should be a dignified structure to contain the worshipping assembly. It should show respect for space and material. Its character should radiate the love of God and the brotherhood. “This example of the Old Testament was followed in New Testament times. Following this example, churches were dedicated from the earlier times as abundant records show, for all churches destined for divine worship in perpetuity must at least be blessed before the sacred mysteries be celebrated in them. And so for this reason we come together this afternoon to bless and dedicate according to most ancient custom, this place to the glory of God and the honour of St. Patrick. In this place will Heaven touch earth. Here we are setting up our Jacob’s ladder to Heaven. From here will ascend God’s angel bearing our sacrifice from this material altar to the eternal altar in Heaven. Here will descend the angles of God bearing his graces to the souls of men, peace and consolation to the troubled, strength to those engaged in the struggle which lasts as long as life shall last against the known enemies of the soul’s salvation, forgiveness to those seeking it. Here will God be present. Here will take off the shoes of sin from our feet for the ground we stand on is holy. Here is Moses burning bush. Here indeed is Sinai with God present not in thunder and lightning veiled behind the clouds of Sinai but behind the veil of the tabernackle”. “We have dedicated our church. We have dedicated it like the old one to St. Patrick. We have dedicated it on the feast of St. Patrick, the patron who brought the faith of Christ to Ireland. We know his appearance well, dressed in mire and Gothic chausible with crozier in hand. His picture is in almost every Irish home, his life story is well known to us, but I do suggest that as a person he is unknown to us. I do not think that the great saint of our island has very little to do with our spiritual life, the man is so obscured from us by nationalism and love of country that it is difficult to think of him as a person. And this is a great pity for he was an extraordinary person. All we have to do to get acquainted with him is to read his confession. He speaks to us across the centuries out of that confession as if he were teaching us today. His words are as important today as they were then but it is more important to follow his example. The two qualities that characterise him are simplicity and love of prayer. Patrick was always devoted to prayer. He tells us himself that he rose a hundred times in the night to pray and that this did him no harm whatever. And simple prayers they were too, sayings from the bible for the most part”. One story, which has clung to St. Patrick is the story of his banishing the serpents from Ireland. Scientists have discounted the story as they say Ireland was cut off from the mainland of Europe before snakes had developed. But tradition once again proves a truer guide to the truth than science. He did banish the serpents- the serpents of false worship. The oldest form of pagan worship known to us is the worship of the snake. The serpent was chosen from all the beasts of the field to represent the spirit of evil in the Book of Genesis because men had made it the central figure of false worship. Our ancestors, the Celts, coming from lands where the pagan cult existed and brought it with them to Ireland where there were no serpents. They made images to supply this lack and it is stated that to destroy a centre of this pagan worship he climbed Croagh Patrick. Our earnest prayer to him today in this new church, which we have dedicated to him, is that he would help to drive the many poisonous serpents of false ideas, the many-headed hydras of hate from our land. And so my friends, we have today dedicated yet another church to the glory of God and the honour of St. Patrick, we have added yet another to the almost one thousand churches that honour him across the broad world and stand pointing their spires to Heaven as witnesses to the truths believed and taught by Patrick, Columba, Eunan and Baithen and all the ancient monks and holy men of the age of saints and scholars and all who came after them in the turbulent centuries that followed, and all the dead, your ancestors and friends who lie buried around the old church and all of you gathered here today. May this church stand like the old one, another 130 years to shelter from the elements all who pray beneath its roof, to be a place of comfort and consolation to all people in life and death till in another time other people serving the same God, believing the same truths may assemble here to dedicate another new temple, built with newer and grander materials of a new and greater age to the glory of God and the honour of St. Patrick. Addressing the congregation at the end of Mass, Bishop McFeely congratulated the people on their fine new church. He said when a decision was made to build it, some thought that they were undertaking too much and they had doubts whether the work could be accomplished or not. Now they could feel proud of this building and more particularly so because it was erected by their own people. His Lordship congratulated the architect and the main contractor and said it was particularly pleasing as the church blended so well with its surroundings, which was always a good criterion for any work of this kind. We who have come here today cannot but feel how you have all been drawn together as a community. I hope that this church will draw you even closer as a community to serve one another and to help one another, proud of the faith you have and ready to come to the church in times of joy and sorrow to speak to God and dedicate your lives to him. In his homily Fr. Deegan had referred to the tradition of faith that existed here, and which went back to St. Patrick, said Bishop McFeely. Perhaps in these days in Ireland few of us can get rid of the sad thought that Christianity had not penetrated the lives of a number of people. After 1500 years we in our own day are witnessing all the dreadful savagery that has blotted our own life- time. I would ask you, particularly today when we recall the proud heritage of our faith and when we come here to dedicate a symbol of our faith, that you would remember in this church and at home and pray that there will soon be an end to all the unchristian conduct that is so widespread among a number of our people. ALL CAN DO SOMETHING TO END VIOLENCE. Every one of us can try and do something to put an end to violence. If we have violence in our hearts, if we speak violence, if we condone violence we are contributing to violence. We cannot wash our hands of the blood that has been shed if we condone and approve of it in our hearts. It would be well for us to examine our conscience and see how deeply our Christianity penetrates into our lives. If we don’t take Christ as an example and follow Christ as an example we cannot call ourselves Christians, if we condone the violence that is going on. His Lordship appealed to the people to pray for an early return to peace in the country. He said young people would benefit from the traditions and great sacrifices which had been made by their fore-bearers in the old church. He hoped they would think of the sacrifices that had been made in the past to keep the faith that had been handed down to them. The people of the parish had been more than generous in contributing to the building of this new church but despite their wonderful efforts and their great work, there was a sizeable debt remaining. He felt confident that from this church streams of grace will go out to you and your families and that in times of need you will turn to Christ for strength and inspiration. Bishop McFeely referred to the recent announcement of the coming of a major industry to Letterkenny when many from the parish would find employment there. Others from the district who had gone abroad might be attracted home again. He urged that they should continue to live in their own district and build up the local community and help preserve the best traditions of the past while sharing in the affluence, which they deserved and which might come to them in the proposed new development. “Don’t rush into the bigger centres of population said his Lordship. You can take advantage by still continuing your traditions of the past, benefiting from that neighbourliness and the quality of life that is part of the Irish country heritage”. His Lordship concluded by expressing the hope that this church would bring many blessings and be a beginning to a brighter era for all. Fr. Deegan thanked Bishop McFeely for his attendance to bless the church and for his guidance and supervision in the building of it. He also thanked the Tinney family for generously donating the land on which the church was built; the architect and builder and those who made contributions towards the furnishings for the church. He thanked in particular the very efficient and devoted committee who had worked harder than anyone for this day and the curate Fr. Herrity, for the great work he had done in collecting so much of the cost of the church. After one hundred and forty four years the old chapel at Drumkeen , once known as “Feely’s Folly”, has finally been demolished. 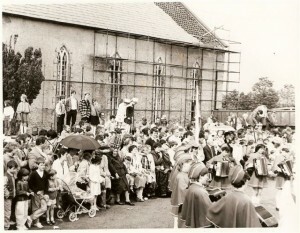 On Monday 23rd June 1986 the scaffolding was erected and the chapel was slowly taken down. It has taken the parish committee three years to find someone willing to do the work and demolish the old church. No one it seemed wanted to try a job as complex. However, after the severe gales in the spring of that year when slates were blown two hundred yards from the chapel, the local curate Fr. D. McGettigan and the committee increased their efforts as they felt the chapel had become a danger to the public. Eventually the Bonner brothers of Drumkeen, Alec Carlin and Teddy Tinney from St. Johnston, were enticed to undertake the work. By the end of the summer the job was complete and the chapel that had served as a place of worship to many thousands down through the famine years and right up to the seventies was no more. The old chapel stood guard over Drumkeen and the surrounding area since it was open in 1842, having been built with funds collected by the then Dean of Raphoe, Dean Feely, when he toured Donegal exiles in Philadelphia. Previous to 1842 the priests used to say Mass in Scalans. These were open-ended shelters, which used to cover the altars and the Mass Rocks and to give shelter to the priests. 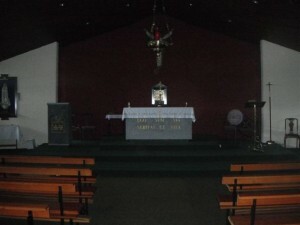 It was in stark contrast to the Scalan that Dean Feely built the new chapel in Drumkeen. He decided that the people had used huts and hovels long enough for the celebration of the Mass, so he opted for height and space in the new building. It was roughly fifty feet high and had a floor area of about four thousand square feet. Because of its height it was once better known as “Feely’s Folly”. Old ordnance survey maps of the 1800’s show a previous church on the site as being in ruins in the middle 1600’s, so for about two hundred years, Drumkeen had no chapel only Scalans and the Mass Rock for the celebration of the Mass. With the changing times of the late 1960’s the people of Drumkeen had opted for a new church rather than modernise the old one. On St. Patrick’s morning 1973, Fr. Michael Herrity then curate in Drumkeen , Said the last Mass in the old chapel and later that afternoon the new church was blessed and dedicated by the Bishop of Raphoe, Rev. Dr. McFeely. 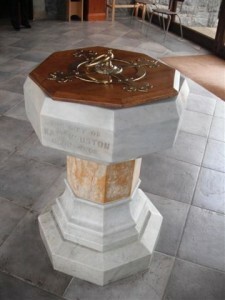 Later the seats and fixtures in the old church were auctioned and the money used to reduce the debt on the new church. For a while the old building was used for bingo sessions and as a training hall for Drumkeem F.C. The football club and the parish committee spent a considerable amount of money trying to keep the old building in a decent state of repair, but the elements beat them and they abandoned their efforts. Steadily its condition got worse until the gales of that year, did a lot of damage to the roof, thus hastening the fate of the building. Alec and Teddy worked long and hard when the weather permitted, removing the slates and timber. They were hampered in their work by the height of the building and the proximity of the graveyard and new tombstones. Eventually they succeeded in getting the roof removed without damage to property or injury to anyone. Then it was the turn of Bonner Brothers who moved in during August. With their digger they tried to help in removing the heavy beams that supported the roof. Some of the timbers were nine inches thick. Nature being what it is the timbers seemed to have a mind of their own and within seconds all the timbers went crashing to the ground, some smashing like matchsticks. Luckily no one was injured. Later that evening a ferocious battle took place between a section of the northern gable and Eamonn Bonner and his machine. Eamonn and his crew got a chain around part of the wall and started to pull with the digger. The wall bent inwards and when it seemed that it must fall, the chain broke and the wall snapped proudly back into position. Again Eamonn got chained up and yet again the wall defied all efforts to topple it by breaking the chain. At the third attempt Eamonn’s persistence paid off and tonnes of rubble went crashing to the ground. Today, all that remains of the one hundred and forty four year old building is a monument built in the centre of the site with some of the cut stone that was used in the building of the chapel windows. The cross from the south- facing gable is imbedded on top of the structure. 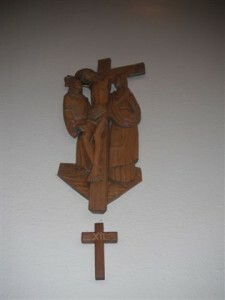 A similar cross from the other gable unfortunately fell during its removal and was smashed to pieces. The site of the” Old chapel” has now been kerbed and filled with top- soil. This is now a beautiful lawn and it will be used for the annual celebration of the Graveyard Mass.